I’ve written posts on encrypting MaxLs and how to use Environment Variables in MaxLs here and here. Today we’ll discuss on how to encrypt a MaxL script which uses an Environment Variable. I encrypted the MaxL using the command given below. However the resulting mxls file was still showing the same contents. Spool file and on-screen data was revealing the user name and password, which is not the desired output. So how to achieve this (encrypt). 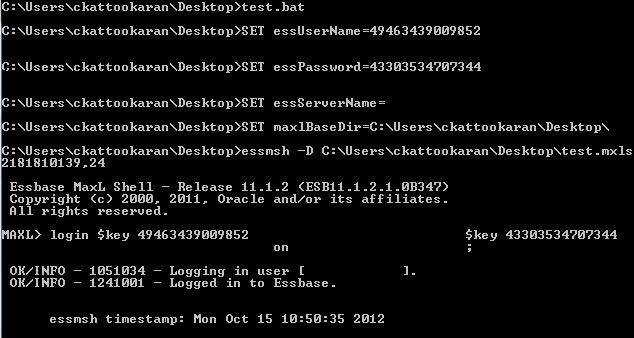 I decided to encrypt the username and password separately as shown below and pass them to MaxL. Later I updated the mxls file and added the keys as given below. Now the spool file is not revealing the user name and password.